A MAN who was among the first on the scene of a horrific single-vehicle rollover has recalled the moment he and another man pulled an injured woman from the wreckage. 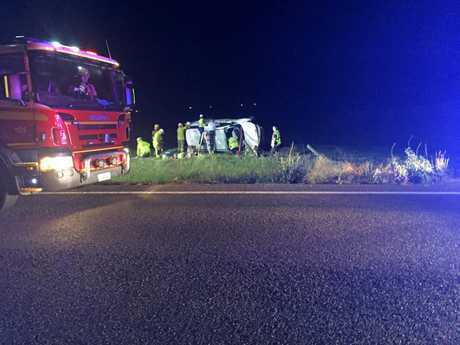 Gurdeep Saroa had been driving on the Drayton Connection Rd at Cambooya about 7pm on Thursday when he saw a white mini-van overtake a ute and roll a number of times, landing about 60m from the bitumen in a paddock. Dialling 000 as he jumped out to help at the scene, Mr Saroa and another bystander smashed the windscreen with a wooden post to free the female front passenger. The pair was unable to free the injured male driver, pinned inside the vehicle. After getting the woman out, Mr Saroa - who was still on the phone with emergency services - worked with the other man to try and get access to the two teenagers in the rear seats. The incredible rescue effort lasted 11 minutes - as long as it took for Queensland Ambulance and Queensland Fire and Rescue to arrive on scene. "I could smell the smoking wires," Mr Saroa said. "It's lucky it didn't catch fire. "It was lucky we were there (driving on the road) otherwise other people may not have realised what had happened." The male driver was airlifted in a serious but stable condition from the scene near the intersection of the Drayton Connection Rd and the New England Highway. His female passenger and two teenagers were taken by ambulance to Toowoomba Hospital with various injuries. It is believed the four were from the same family. The crash is the latest in a series of serious, and fatal, traffic incidents since last month. Road Policing Unit Officer-in-Charge Brendan Harding of the 11 fatal crashes in the Darling Downs district since April, eight had been single-vehicle crashes. "Inattention is a consistent factor to crashes that we're having within this district," Acting Senior-Sergeant Harding said. "We've had a substantial increase in the number of vehicles using the road network now, and part of that is to just be patient. "At this point in time, we are starting to move into a high-priority period so let's get it straight in our heads." 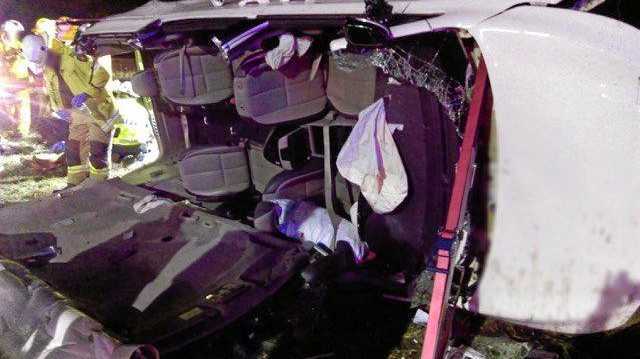 He urged all drivers to remember the Fatal Five, and to always drive to the conditions. The Cambooya crash remains under investigation.